Kazaviti, access on Thassos, ferry boat time table, airlines to Greece. Location of Kazaviti on Thassos island. The village is located on the western side of Thassos Island, inland from the coast, in about 320 meters above sea level. Kazaviti is regarded as one of the oldest settlements on Thassos. It was the third largest after Theologos and Panagia until the beginning of the 19th century. Its history can be traced back to the Roman and even to the classical Greek period. The name is probably of Latin origin: “casa vitis”, that means “house of the vineyard”. Thassos in antique times was famous for the high quality of her red wines and Kazaviti had the best vineyards on the island. The mountain village of Kazaviti on Thassos is situated 4 kilometres inland at the end of a wide green valley. The access road branches off the island’s ring road within the settlement of Prinos, at a sharp bend to the right: there the road to Kazaviti continued straight on, passes several shops and then gently ascends the valley. Past the settlement of Mikro Chorio until reaching the steep drive way into the village of Kazaviti (=Ano or Megalo Prinos), just before the end of the asphalt road. Parking facilities at the central parking area just below the main square. …off the tarmac road, just following the course of the stream bed and old field paths. After leaving the settlement of Prinos on the main asphalt road that winds up to Kazaviti (= Megalo or Ano Prinos), walk for 5 min until a storage building appears on the right hand side. Turn right at the end of the fence at the sign board and pass through the (usually dry) stream bed at an old plane tree. Then immediately turn left and follow the red paint dots and arrows up to Kazaviti village. The wide valley between mountain slopes of medium height has preserved its abundantly rich landscape under cultivation since antique times. Follow the quiet path gently upwards through lush greenery. You pass groups of ancient olive trees, vineyards and patches of diverse wild growing vegetation, also some higher forest and the rocky bed of the stream. After app. one hour – already in full sight of Kazaviti in front - you reach a broader dirt track road: there you turn left and at the near junction with the asphalt road, you turn left again (down hill) for the short distance to the junction with the Old Road of Kazaviti that branches off to the right. Look for the red marks on the road. Now you approach the bottom quarter of Kazaviti with its old stone houses. Total walking time is 1 to 1 ½ hours. Wear hiking shoes and take a bottle of water along with you. From the port of Kavala on the mainland there are regular car ferry connections to Skala Prinou on Thassos. The crossing takes app. 1 ½ hours. The distance from Skala Prinou to Kazaviti via Prinos is 7 kilometres. From Kavala there is also a hydrofoil (“dolphin”) service to Skala Prinou (only passengers, no cars). Crossing time 30 minutes. The seasonally changing ferry boat time tables of Anethferrys. The main route for foreign visitors arriving at Kavala airport (Meg. Alexandros Airport at Chrysoupolis) extends first by road to the port of Keramoti, from there by ferry boat (20 minutes) to Limenas town on Thassos. The distance from Limenas to Kazaviti is 22 kilometres. 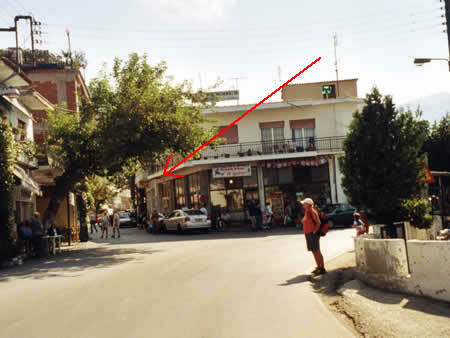 There is a regular public bus service (KTEL) between Limenas and Prinos. Charter flights to Kavala airport operate frequently all over the tourist season. It might be cheaper, though, to book a flight to Thessaloniki and drive to Kavala by rented car, app. 1 ½ hours, or by bus (departure every full hour, 11 € one way, app 2 ½ hours). For airlines to Thessaloniki click here .